Colonial South Events started with two reenactors and students of history who believed that Colonial history in the American South deserved to be interpreted. The American South has an amazing history in the seventeenth and eighteenth centuries that often sees very little attention, in part because it is more difficult to access than more recent eras of American history. So the idea was simple–events that bring the rich Colonial history of the American South to others in an interactive, immersive environment. Reenactors work with local historic sites and organizations to bring history to both guests and volunteers. Colonial South Events is proud to host the first eighteenth century reenactments in Charleston in fifteen years. Sean Wallis has been reenacting since childhood. With fifteen years of experience, he has been a member of different units and factions, fighting for both the Crown Forces and Continentals. He has worked as a historic consultant, and played roles in many documentaries and films over the past decade. His most recent roles are as Tadeusz Kościuszko in the award-winning film John Laurens’ War and in the final season of AMC’s series Turn: Washington’s Spies. 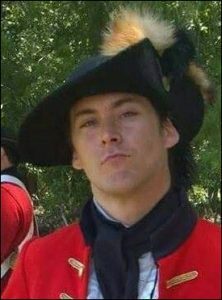 He has also worked at historic sites and museums such as Old Salem and the Old Exchange and Provost Dungeon, and has trained other reenactors and soldiers in the art of eighteenth century warfare. In his spare time, he practices fencing, rides horses, studies physics, and writes elaborate Shakespearean sonnets. (Okay, we were kidding about the poetry part.) He also knows every Monty Python movie ever made. Sean is the main event coordinator, organizing the battles and units for our events and recruiting reenactors. He is also the primary press contact for Colonial South Events. When not organizing events, Sean can sometimes be seen in period attire giving ghost tours or history walking tours in historic Charleston. Ariel Dinkins is a history student, interpreter, and tour guide in Charleston. 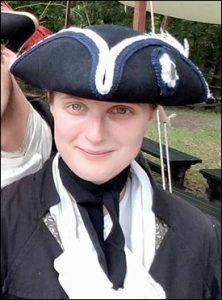 She currently studies history and literature at Charleston Southern University, and her specialty is in eighteenth-century America. She has worked at historic sites such as the Old Exchange in Charleston, and has helped coordinate educational programs with other sites such as the Power Magazine Museum. In addition to American history, Ariel has also studied European and modern East Asian history. She has been involved in historic interpretation of seventeenth and eighteenth century America and World War I. She has also worked as a horseback riding instructor, aide, and English tutor. When not out reenacting at historic sites, she practices programming and graphic design, classical singing, and horseback riding. Ariel is the primary public speaker for the events, and also handles all of the designs and paperwork for online and offline content. She does the historic research and writing for our programs, and handles other administrative functions. She also designs and manages colonialsouthevents.com.